TL: DR: The convergence of artificial intelligence and genomics may revolutionise healthcare and usher in an era of personalised medicine. While researchers and clinicians are convinced of the value of AI-assisted genomic analysis, laypersons may not fully appreciate the benefits of these technologies. Beyond technological innovation, society also needs innovation in terms of regulation and policy to steer AI and genomics into the future. When you purchase build-it-yourself furniture from a store, the item comes with an instruction manual telling you how to assemble the different parts into something functional. Similarly, the cells in our bodies each have their own instruction manual—the genome—made up of three billion base pairs of DNA. By reading this large and complex genetic code, cells decide what to become, where to go, and when to die. With the advent of genome sequencing technology, scientists and clinicians can now spell out all three billion ‘letters’ of the human genome. However, deciphering the meaning behind these ‘letters’ remains an immensely difficult task. Given the thousands of genes and mutations present in the human genome, associating particular genes and mutations to specific diseases is a major challenge. Fortunately, the genome, once sequenced, can be treated as digital data, and in recent years, a formidable workhorse for making sense of large datasets has emerged—artificial intelligence (AI). 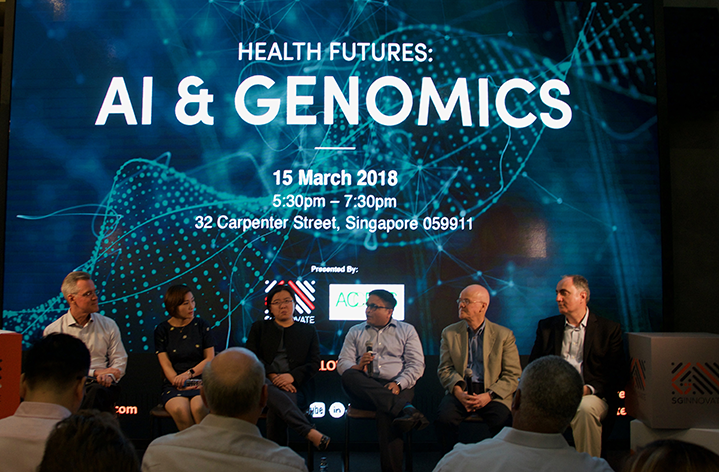 At SGInnovate’s Health Futures: AI & Genomics seminar, a panel of experts discussed how AI is working alongside doctors and researchers to uncover the secrets of the human genome. Moderated by SGInnovate CEO Steve Leonard, the panel consisted of Dr Robert Morris, professor, Yong Loo Lin School of Medicine, National University of Singapore; Dr Liu Xiaoqing, director of artificial intelligence, Complete Genomics Inc.; Dr Joanne Ngeow Yuen Yie, senior consultant, National Cancer Centre Singapore; Dr Devanathan Raghunathan, principal, Exploit Technologies Private Limited; and Dr Mark Burby, health and life sciences director, Intel. The interface of genomics and AI is fundamentally an attempt by the medical profession to overcome bottlenecks. Thousands of genomes have already been sequenced, representing a treasure trove of data—one that leaves clinicians overwhelmed by the sheer volume of information it holds. This sentiment was echoed by Dr Ngeow, who added that the greatest threat to healthcare in the next decade was not emerging or infectious diseases, but rather, clinician burnout. “Nearly 60 percent of doctors are walking out on healthcare because they feel overwhelmed,” she said. The promise of AI, then, is to help doctors mine the medical literature and pick out actionable insights more quickly and easily. This could mean using machine learning to map rare mutations against appropriate screening tests, or to recommend well-substantiated treatment guidelines, said the panel. “[With AI], we can also combine other data sets, such as family history and environmental data, with genomic data to get the right kinds of insights. This is a very nascent area right now, but I think we are going to see a lot of developments over the next few years,” said Mr Burby. While researchers and clinicians see clear benefits in using AI to parse the genome for personalised and more effective therapies, the general public does not seem to be as enthusiastic or optimistic about these developments. This was what Mr Raghunathan gleaned from a small social experiment that he conducted, where he surveyed people between ten to 50 years of age about what they thought AI and genomics would mean for them. “Surprisingly, not many of them think of AI and genomics in terms of personalised medicine for diseases or cancers. If you ask what makes them healthier, they may say ‘eating healthier food’, not AI. They are not thinking about how [AI and genomics] could come together to improve their lives right now,” he said. Such a mindset poses two problems, Mr Raghunathan noted. Firstly, when the commercial prospects of AI and genomics are not fully appreciated, it may take a longer time to bring such healthcare solutions to market. But more broadly, when laypersons do not understand the potential benefits of these technologies, they may be hesitant to share their data with scientists and clinicians, and this hampers further development and validation of AI-assisted genomic analysis, said Mr Raghunathan. DNA = Do Not Access? Another concern with data sharing, especially when it comes to genomic data, is privacy. Dr Morris observed that some countries allow genomic information to be traded with insurance companies, while Mr Burby highlighted that anti-data-blocking legislation is gaining traction the world over. In this context, an individual’s genome becomes a commodity, and the person whose genome is being traded may not be comfortable with who has access to it and how it is being used. There’s a role for governments to guide society and make sure that things don’t move too quickly,” Mr Burby cautioned. Dr Liu also highlighted how the relatively high cost of obtaining, disseminating and analysing genomic information may prevent some individuals in society from accessing such medical services. Governments must therefore consider the egalitarian aspects of tapping on genomic data to improve healthcare. “Society also needs innovation in terms of regulation and policy. I think it all has to go in parallel with technological innovation,” said Dr Ngeow, rounding up the discussion.